Of course the subtitle above is meant to be satirical, but I was still surprised at how many raised eyebrows I received when telling others of my plan to travel to Iran. For me it was a no brainer - it has enough historical, cultural and political relevance to top whichever criteria a travel list might use. On the other hand, it does have a reputation of inaccessibility (probably caused both by internal and external forces) and Muslims of the Sunni persuasion seemed to have an even more averse reaction to the Shia majority country. But it was the rapidly changing state of the world (see: Iraq, Syria) and a developing Iranian tourist cottage industry that convinced me to check out the place sooner rather than later. That and a real sense of ignorance about the place - of course it goes without saying that its not the evil place western (and some religious) media tells us it is, but it would have been equally naive to assume it was the complete opposite. I was going in with a blank slate and was prepared to learn a lot. Once I had decided to go, everything appeared to fall into place relatively quickly. I asked a (Shia) friend who had previously been about visa advice, at which point he decided join me on the trip. I was then introduced to a budding tour operator from Isfahan who arranged almost everything I would need on the the trip, from drivers and local guides to food and most importantly money - there are no international credit cards in use in Iran, and the official government exchange rate forces a visitor to use the black market if they want any kind of value from their foreign currency. Speaking of which, as the rate was so much in our favour the whole trip promised to be great value so that was a bonus. The only real downside to the trip was its length. The eight days in total that we had was limiting, and as I always plan "as if it's my last trip" the itinerary we ended up with seemed pretty ambitious on paper. My friend had as much energy and drive as I did so it had a real chance of working out. The first surprise of the trip was at the airport. We were past immigration and with our luggage within 15 minutes of landing, which was pretty efficient for a xenophobic and watchful regime. Although we had landed in Tehran, the plan was to head south from the airport (as it was itself south of the city) and hit the road. And so our first stop in Iran was actually Qom. Qom is significant in being the global centre of Shia academic study but for passer-bys the main attraction is the Haram in the centre. 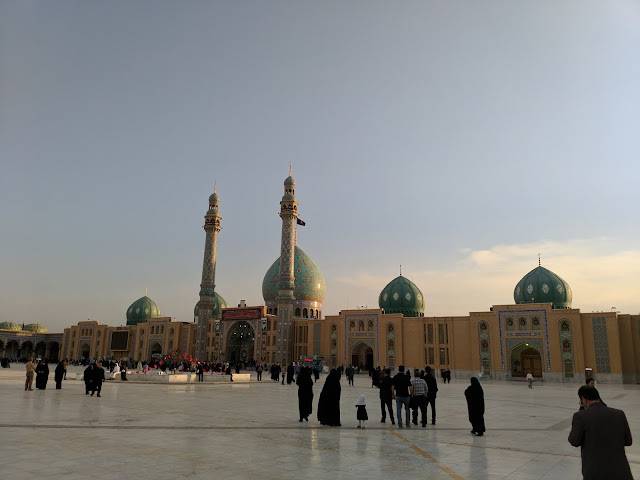 Here we found the Holy Shrine of Fatemeh Maasoume as well as the Imam Hasan Askari Mosque, our first glimpse at Persian-Shia religious architectural styles. I've opted to include shrines in my rolling list of sites as in Iran they appear to serve as much as a place of worship as mosques do. After a quick walk through the Qom historical bazaar and drive by the Gonbad Sabz Garden (which was closed) we headed south to the Jamkaran Mosque. This is said to be the place Imam Mahdi anonymously visits every Tuesday evening, bringing huge crowds with him. Although today was Tuesday our schedule didn't permit us to stay too long, but although we didn't get to experience that particular audience the mosque itself was impressive enough for the visit. We then made a beeline to our next city, Kashan, where we were to spend the night. Before heading for dinner and then bed, we visited the historical bazaar here too - it was the same as Qom's but different, a feeling we were to see elsewhere in city planning and character. Although we were a fair few leagues off I was beginning to channel Aladdin, Prince of Persia and the like. The second surprise of the day was the thunder and lightning we witnessed that evening.